A North Carolina couple waited for nine months until a grave marker was placed on their 5-year-old boy’s resting place this September. But when they visited their son’s resting place last week the grave marker was gone. Crystal and Wayne Leatherman ‘s boy Jake lost his fight against leukemia a year ago, WBTV reported. The boy’s funeral made national news when several star NASCAR racers attended after learning that they were the boy’s heroes. 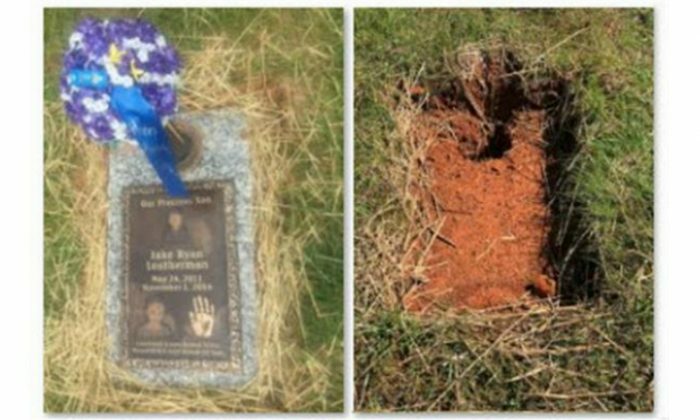 After discovering that the grave marker was missing last week, the parents learned that the manufacturer repossessed it over a payment dispute. “He repossessed it like it was a car,” Crystal Leatherman said. Rev. J.C. Shoaf, the owner of Southeastern Monument, said the couple paid in full for the marker but made several changes later, which resulted in a bigger bill. “If you buy something, you’ve got to pay for it. No matter what it is,” Shoaf said. But the couple knew nothing of the additional charges and said they would have paid them if they had been aware. Shoaf said he felt for the couple. When asked why he had placed the stone there in the first place, he said he did it out of goodwill. “Because they had been through so much emotionally, grieving so hard, I thought we’d just go ahead and do it,” he said. Shoaf said his company has not removed a grave marker in 54 years. Now he feels for the family. “They’ve been through an awful lot, I know that. And right now, they’re thinking emotionally, and having that grave out there unmarked—that’s emotional trauma. I lost a child, I know what that is,” Shoaf said. The couple was looking for another company to make a replacement stone. They were also considering hiring an attorney. When their story was aired on a local news outlet, they received an outpouring of support. A lawyer offered to represent them for free. Two companies offered to replace the grave marker for free. As a result, Shoaf decided to return the grave marker to Jake’s resting place and mark the family’s bill paid in full, WBTV’s Molly Grantham reported. Shoaf also said that his company will pay any expenses the cemetery charges for replacing the stone. “We will pay all expenses for doing that and we are sorry that this has happened,” Shoaf said. Jake’s mom said she wasn’t going to let the matter go.